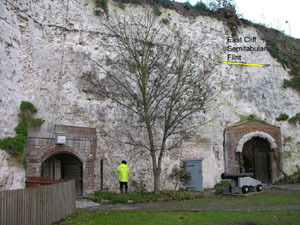 Fort Amherst is designated as a RIGS site because it provides a high quality exposure of the infrequently exposed Rochester Hardground and the East Cliff Semitabular Flint. The site has good educational potential for study of the higher part of the Kent chalk sequence. Fort Amherst is part of a network of Chalk RIGS sites in the Medway Valley. It is situated within the urban area of Chatham. 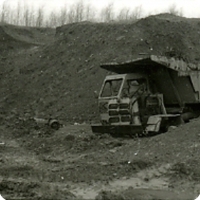 Excavations associated with the fort allow access to part of the lower Upper Chalk (i.e. the upper part of the Coniacian Stage, exposures straddle the Micraster cortestudinarium-Micraster coranguinum zonal boundary). In the lower part of the visible section the Rochester Hardground is well developed. This is a submarine mineralised erosion surface that represents a significant break in sedimentation. When compared with the Kent coast over 10 metres of strata above the hardground are missing. 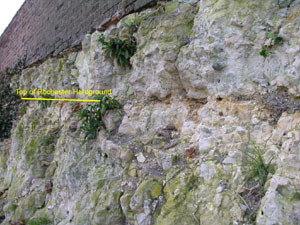 This gap indicates local tectonic activity in the Medway area and a sea level fall during this interval of the Cretaceous. Overlying beds show fossiliferous chalk with a series of well developed nodular and semi-tabular flints. A conspicuous semi-tabular flint, comprising elongate lenses of black flint lies at the top of the section. This is the East Cliff Semitabular Flint, a distinctive marker bed that extends throughout the Anglo-Paris basin. Fort Amherst was surveyed for designation as a RIGS in December 2005. Access is easy in collaboration with Fort Amherst. General safety is very good - the site is open to the public. Care must be exercised when closely examining exposed surfaces as some faces are near vertical and hence there is the risk from falling debris.